Essential Therapeutics products are produced in licensed manufacturing facilities that strictly adhere to current Good Manufacturing Practices (cGMP’s). Products provided in tablet, capsule, and powder form are made in a manufacturing facility licensed by the State of California as a drug manufacturer and food processor and registered with the Food and Drug Administration as a drug manufacturing establishment. The facility is also approved by governmental agencies in the United Kingdom, the European Community (EC) and Australia to manufacture a drug product. Current GMP’s and written standard operating procedures (SOP’s) are strictly followed through all stages of production to produce products that meet or exceed United States Pharmacopeia (USP) standards. Active ingredients used in Essential Therapeutics products are selected based on their purity, bioavailability, documented actions, and safety characteristics. USP materials, i.e., those meeting USP standards, are used for those nutrients where this standard exists. Raw materials are purchased exclusively from reputable vendors who provide detailed Certificates of Analysis for every lot of material. These certificates certify that active components, toxic elements, and microbial content are within specified acceptable parameters. Purity and potency of selected raw materials are verified through independent testing laboratories. All incoming raw materials undergo quarantine, inspection, and evaluation. On-site laboratory personnel evaluate physical characteristics of each finished product including hardness, disintegration, moisture balance, friability, and pH. Purity and potency of finished product is independently verified through outside commercial laboratories using a randomized ingredient and batch testing program. 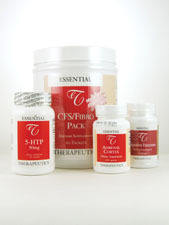 Essential Therapeutics products are free of artificial flavors, preservatives, and colorings. Naturally-derived, inert excipient materials, including cellulose-based excipients, vegetable-derived magnesium stearate, and silicon dioxide are used in very small amounts as tableting and encapsulation aids. Tableted products are protected with an inert, water-soluble cellulose coating that dissolves readily upon ingestion, thus facilitating tablet disintegration time.